The state police provided this photo the day after the Dec. 15 tanker crash on Highway 22E. 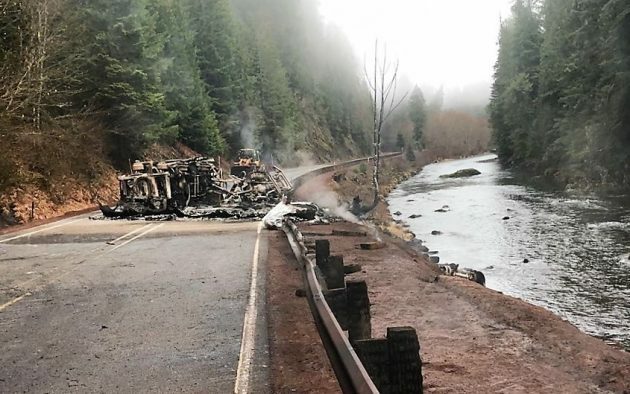 None of the fuel lost in a fatal tanker truck crash on the North Santiam River has been detected at downstream water intakes, Albany City Manager Peter Troedsson told the city council Friday. The Central Petro tanker crashed and burned near Milepost 64 on Highway 22E about 11 p.m. on Dec. 15. Oregon State Police said the rig apparently lost traction on ice and rolled. The driver, Ronald Edward Scurlock, 59, of Bend, was killed. The truck had been loaded with about 11,000 gallons of gasoline, and it was not known how much of the fuel burned and how much may have spilled into the river. Albany’s main water intake, for the treatment plant off Scravel Hill, is just below the confluence of the North and South Santiam Rivers, roughly 50 miles downstream from the crash site. The report didn’t identify the four upstream intakes. From the crash site, though, the river flows past Detroit, Mill City, Mehama, and Stayton on its way to becoming just plain the Santiam River near Albany. KGW reported that Salem, which also takes its water from the North Santiam, temporarily closed its intake as a precaution. The brain-freeze screwup in the date, as pointed out by the reader below, has been fixed. Thanks. Your post says the accident happened on Feb. 15th. Should that be Dec. 15th? Does “non-detect” mean they’re not detecting gasoline or they’re not detecting FOR gasoline? Jargon is ambiguous. Knowing there are at least as many unknowns as there are knowns, the detection / non-detection dilemma is a determined conundrum. Wondering if anyone did the math? Detroit Resv has volume of 455,000 acre feet of water. Each acre foot has a volume of approval 365,000 gallons. Even if all 11,000 gallons of fuel went into the water dilution would so great doubtful the testing could find it. In addition there is more volume in Big Cliff. Testing would just be for public comfort. So test or not to test? That is the question. Public comfort for the sake of comfort? Math? Reminds me of the current satirical joke under 45’s EPA. Ayn Rand, Rand Paul & Paul Ryan walk into a bar. The bartender serves them tainted alcohol because there are no regulations (or proper dilution in this case). Nicely reasoned. Even discounting the water volume by 90% to account for mixing, we end up with a concentration below the dedection limit. However hard data outplays theory in court. Given Floyd’s cheery assessment, perhaps our worries are misguided.